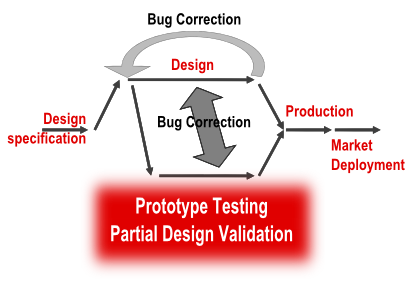 Byte Paradigm’s prime focus is to deliver innovative solutions to better test and debug electronic embedded systems. One of our favorite activities consists in listening to our customers and understanding the new challenges of efficiently designing an ASIC, a SoC, a FPGA or a full system board. With growing system complexities, we think that using a ‘real hardware’ or a hardware prototype of the system during the design cycle is complementary to simulation and other EDA-based techniques. All our solutions are composed of a optimized pair of software running on PC and dedicated hardware at the interface with the embedded system under test. They use standard interfaces widely available on standard PC. This combination guarantees up-to-date software environment, and maximizes the value of your investment. Understanding a digital electronic system’s behaviour implies getting visibility over it. Probing digital signals, visualizing digital connections and bus traffic, analyzing SPI or I²C bus help you minimize project risk. LOG Storm logic analyzer, high speed data logger and SPI/I²C analyzer is a powerful PC-based instrument system that will help you validate the functionality and performance of your embedded system. Increasing embedded system complexities together with higher speed chip-to-chip serial interfaces require an adaptation of testing tools. Accessing digital ASIC, SoC and FPGA, memories and register involves reading and writing high-speed serial interface with standard or custom protocols. SPI Storm devices are the fastest and most capable USB Serial Host Adapter available today. Digital input stimulus generation is system analysis’ counterpart. When going to ‘real hardware’ prototype early in the design cycle of your embedded system, a digital stimulus source allows emulating the missing parts of your embedded system. Our powerful PC-based digital pattern generators easily tackle most stimulus-and-response testing scenarios.